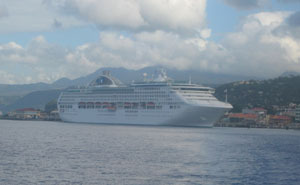 The most significant transformation ever of a Princess Cruises ship will occur this spring aboard Grand Princess. Larry and I sailed on this lovely ship in the Eastern and Southern Caribbean a few years ago and look forward to cruising on it again after its make-over. The changes will be made during a drydock from April 11 to May 4 at the Grand Bahama Shipyard in Freeport, Bahamas. 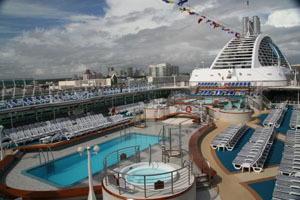 During this makeover the ship will receive many of Princess’ trademark features introduced since the ship’s 1998 debut including the signature Piazza atrium. Several new features will be added including a unique tea lounge and library called “Leaves” and “Alfredo’s,” a full-service pizzeria. A new nightclub called One5 will be created on the top deck of the ship, replacing Skywalker Nightclub. This change will significantly improve the operational performance of the ship, including greater fuel efficiency. New Piazza atrium– The atrium space of Grand Princess will be completely rebuilt to include this signature Princess feature -- a multi-faceted social hub combining quick bites and light meals, beverages, entertainment, shopping and guest services. Passenger will also enjoy a new Vines wine bar offering a selection of more than 30 wines by the glass, plus tapas and sushi, and a wine shop where passengers can purchase their favorite bottle. Leaves Tea Lounge and Library– A fusion of tea lounge and library, the new Leaves offers an opportunity for passengers to custom-blend a variety of base teas with herbs, fruits and spices. A trained tea sommelier will assist passengers in blending their personalized tea creation, which they can enjoy in the library with a good book. Alfredo’s Pizzeria–A new sit-down pizzeria, Alfredo’s will feature an enticing menu of freshly prepared individual-size pizzas. Named for the line’s master executive chef, Alfredo Marzi, the pizzeria will showcase an open kitchen where passengers can watch chefs create pizzas. One5 Lounge–One5 Lounge will become the hippest place for nighttime dancing and relaxing. The new lounge on deck 15 (hence its name) will offer a cool vibe, contemporary seating and lighting, and a dramatic back-lit bar. Crown Grill– A classic steakhouse with rich wood surroundings, this specialty restaurant features an open theater-style kitchen where chefs custom-prepare premium aged beef and fresh seafood items, including live lobsters. The renovated Grand Princess will debut on May 5 in Ft. Lauderdale where the ship departs on a transatlantic crossing for her summer and fall homeport of Southampton, from which she will cruise a variety of European itineraries. Information courtesy of Princess Public Relations, publicrelations@princess.com . For more information contact your travel agent or www.princess.com.